Quick summary: In this activity students look at what happens to their lunch waste, learning about the best ways to dispose of their lunch waste and how to avoid littering. Students work as a class to discuss the waste in the lunchboxes, and then work independently to complete a colouring in worksheet around this activity. Students understand that different types of waste can be reused, recycled, composted or treated as rubbish. Students understand that different types of waste and should go into different waste containers. Students take responsibility for belongings and for avoiding littering. Syllabus Outcomes: GE-1, GE-2, ST-4WS, ST-9ME, EN-1A. Level of teacher scaffolding: High – teachers will need to lead all activities and keep an eye on how students dispose of their waste. Resources required: Students’ lunches, bins for at least rubbish and recycling, copies of worksheets, appropriate safe scissors and colour markers/pencils. Keywords: Waste, rubbish, recycle, reuse, compost, litter, bin, box, lunchbox. These Planet Ark resources were developed by Cool Australia with funding from the Alcoa Foundation. Overarching learning goals: In this activity students look at what happens to their lunch waste, learning about the best ways to dispose of their lunch waste and how to avoid littering. Through this activity students begin to understand that different types of waste can be reused in different ways and should therefore go into different waste containers. Teacher content information: Foundation year students have a wide range of new things to learn about when becoming part of a school community. At this age one aspect of being part of school community is taking responsibility of one’s personal belonging, including one's lunch and the associated waste. In order to take responsibility for their waste, students will need to understand the school’s waste system so they can make sure their waste is disposed of properly. 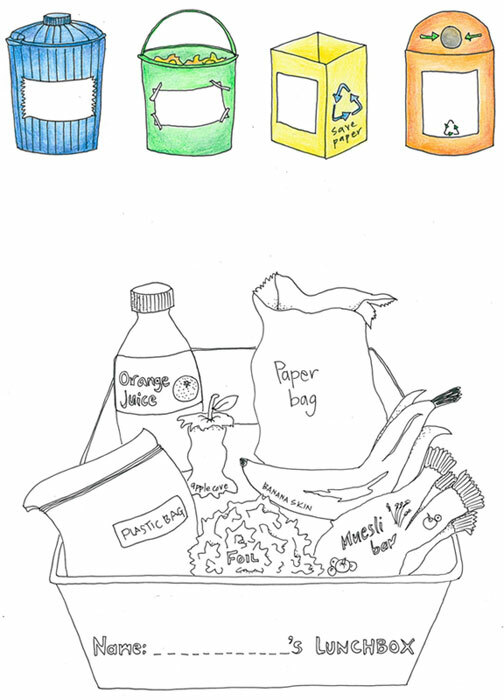 Draw one type of rubbish that you might find in your lunchbox that you can recycle. Colour in the waste items the same colour as the correct bin it should be placed in. Managing Classroom Waste - Video 5 from Cool Australia on Vimeo.